Beautiful evening with the 4 day old Moon above Venus and the planet Jupiter above the crescent Moon. 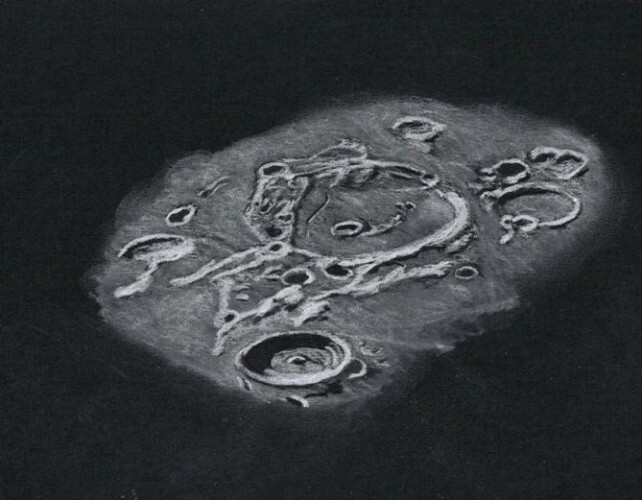 After a careful look at the crescent Moon through the telescope at low power, I needed to decide if I should attempt a sketch of the beautiful view of western Mare Crisium or the crater Furnerius which was the easier target. Considering the air temperature which was cold, I took the easy way out and sketched Furnerius. With the terminator well past this region, I knew I would have time to go indoors and warm up if I got too cold. I centered the eyepiece on my target and turned on the equatorial drive platform. Furnerius is a large 125 km. crater that has the appearance of the old pre-Nectarian period crater it is. Its walls and floor are battered with many small craters and Rima Furnerius was detectable on the northern side of the floor. Crater Fraunhofer (57 km.) another old crater was sketched to the south and much younger Stevinus (77 km.) was showing off its central peak to the west. Wow Frank – nice sketch & -6 degrees to boot! real great moonsketch. I´ve never tried the technic with black paper, but I think in future it is a further opinion to draw the craters of the moon. Thank you both for your kind words. Great observing to you both. Very great sketch. he technic you used is talentous. The resutl is beautifull, congrat ! !